This cottage was built after 1925 behind the Mayer family’s bayfront home, Shore Haven. Through the years it served as guest house, bath house, caretakers’ cottage and annex. In the 1950s and 60s Hannah and Isaiah Gavin, after farming and living on Sanibel for decades, stayed there to help widowed Daisy Mayer with housework and gardening. The Gavin grandchildren often visited them there. 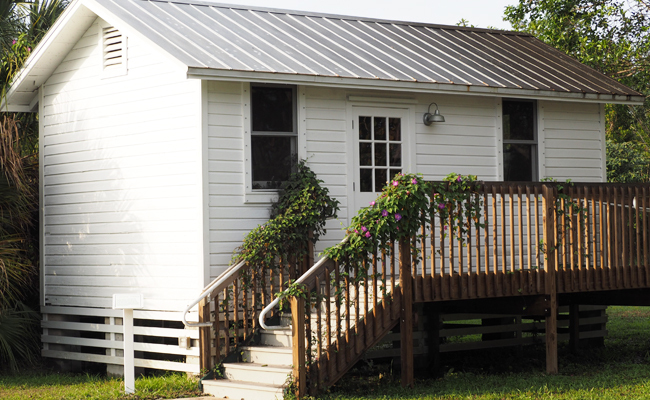 It was donated and moved to the Sanibel Historical Museum and Village with Shore Haven in 2012 and features an exhibit of Sanibel’s Black History.